Ever since seeing Spark “on the news,” Shawn Jones, a 19-year-old freshman at Indiana University-Purdue University Indianapolis, walks to Monument Circle almost every day to play ping-pong and meet new people. “I love my city,” Jones said, enthusiastically, as he sat with four others he’d just met — one celebrating her 30th birthday. Part of Jones’ routine, he said, is to stop in at Rocket Fizz to choose from the stores array of eclectic sodas. Jones isn’t the only Spark participant who is frequenting Monument Circle eateries. The owner of Potbelly Sandwich Shop, Chuck Brewer, said that while there’s no way to for him to be completely certain of which traffic comes from Spark, his store’s sales have increased up to 20 percent per week since the program began August 1. The consistent boost in sales has allowed him to hire two new workers to cover shifts. Brewer pointed in particular to the green outdoor seating that Spark has placed around the Circle. He said the new outdoor seating has provided more seating inside his restaurant because a lot of customers have chosen to sit outside. “It’s a simple math equation,” Brewer said. Soupremacy is right around the corner from Potbelly. Store Manager Danielle Shipley, who has worked at the restauarant since it opened, confirmed that while sometimes her restaurant’s location on one of Monument Circle’s “spokes” leads to less food traffic, Supremacy has also have seen increased sales of up to 10 percent per week since Spark began. The weekends, she said, have been especially busy, and she has noticed Spark workers frequenting her shop for meals. Shipley also noted that Spark has brought positive publicity to a place that too often only gets negative media attention. And that spreads the perceptions outward to the city as a whole. 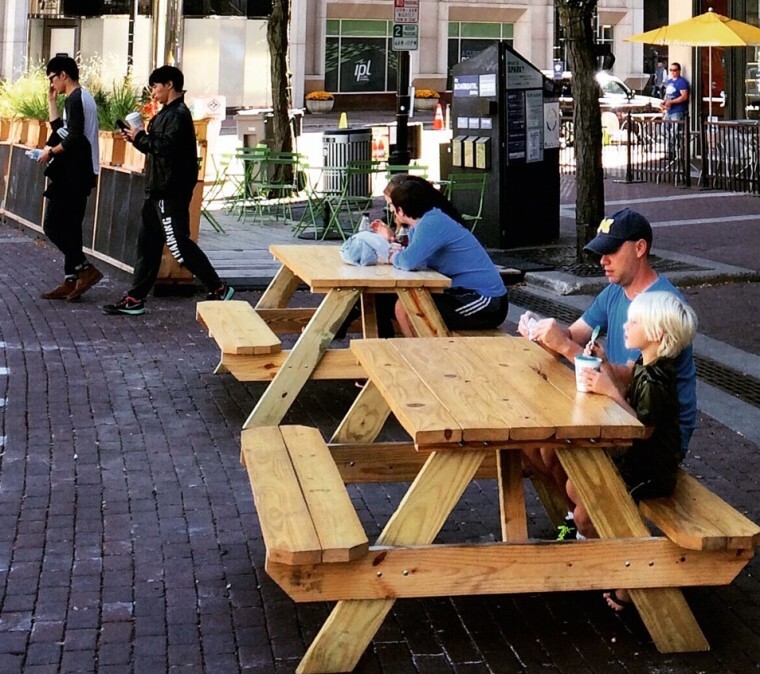 Both Shipley and Ernesto Small, an associate at The South Bend Chocolate Company – located just a few feet from Spark’s welcome trailer – mentioned that they’ve noticed a difference in the kind of traffic at Monument Circle. The Circle, they said, tends to get a lot of business and motorcyclist traffic. But they have recently noticed more families, young people, and tourists spending time there. The credit for bringing that crowd in, Shipley and Small said, goes to Spark. Small has worked at The South Bend Chocolate Company for more than a year. He he has played chess outside on one of the Spark tables and has learned the names of Spark staffers. He doesn’t have access to the exact numbers, but he knows The South Bend Chocolate Company has seen increases in sales as well. According to Small, several tourists recently visited The South Bend Chocolate Company en route to Minneapolis from Cincinnati. They had never been to Indianapolis before, but they were impressed by how inviting the Spark program made the Circle as a whole. Small said the guests told him it made them want to come back to Indianapolis. Along the way, Spark has been surveying hundreds of visitors — both tourists and locals — and gathering data about how people are using the Circle. Spark will also work with nearby businesses to gather numbers to support the positive stories. 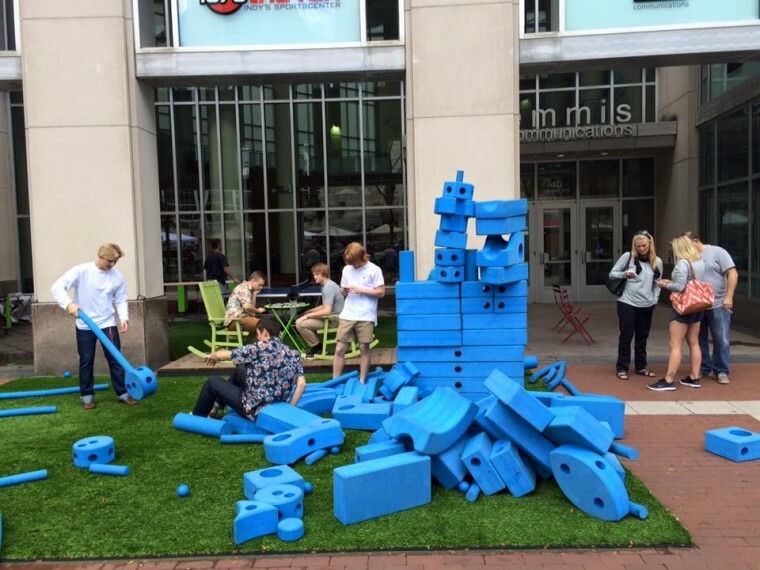 With Spark programming nearing its end this week, this leads to the question: what can or should be next for Monument Circle, particularly as Indianapolis makes decisions about how to program and design the Monument Circle area? Jones, Brewer, Shipley, and Small all seemed to agree: they want more of what Spark has started. Saturday, August 29: experience a sensory parade around the Monument, designed by artist Rebecca Pappas, profiled here (and pictured above). Conflict abounds in everyday life. We can find a reason to argue over just about anything. Despite this fact, in my thirty years on this planet, I have never heard anyone argue over or disparage parades. They are a universally beloved event. Pappas recently moved from her previous home of Los Angeles, CA to Indianapolis after accepting a job as a dance professor at Ball State. In LA, Pappas collaborated predominantly with professional dancers and in more traditional, theater settings. However, her interests began to shift in the last several years. My routine of walking from my home in Fletcher Place to Monument Circle for Listen Hear’s ambient, experimental, Mellow Monday set was interrupted due to weather this week. A late afternoon rain was showering downtown Indy. Despite the weather, the performance by local multi-instrumentalist Rob Funkhouser was scheduled to proceed – rain or shine. With walking out the window, I called an Uber rather than attempt to negotiate parking. “Look at that mural!” my driver chuckled as we emerged from beneath the parking garage on Virginia Ave. She was pointing at the image of a man on a ladder, supporting an impossibly large scroll. Franklin, TN muralist Michael Cooper, designed the piece, entitled “Indy – Always On A Roll!” My driver admits she has never noticed the mural. Rain falls steadily as we roll onto the circle from Market Street. Upon exiting my ride, I see Big Car’s Spark crew arranging chairs beneath the marquee in front of Hilbert Circle Theatre. On a folding table in front of the chairs, Funkhouser is assembling his rig: a MINIBRUTE SE analog synthesizer, a MacBook Air, a composition notebook and a cluster of cords connecting the devices. Droves of umbrella-headed business suits pass by abandoning their day’s work at their desks. By the time the bells toll at Christ Church Cathedral signaling the six o’clock hour and the start of Funkhouser’s performance, the rain is reduced to a drizzle and the large cabanas arranged to protect the crowd and Funkhouser’s gear are deemed unnecessary, folded, and set aside. The sun peeks through the clouds, baking the soaked bricks of the circle. Funkhouser kicks off with spacey, ambient notes that seem to sparkle and burst like globs of hydrogen in the cosmos. The music becomes more full, with Funkhouser adding swaths of sound by playing chords on the keys of his synthesizer. It grows darker and more ominous, with the occasional wave of calm. A pattern of distortion cuts through the atmosphere adding a backbeat to the ambience. A teenage couple looks on while silently sipping fluorescent sodas before ambling onward. Big Car executive director Jim walker captures photos or video footage from a tall tripod across the street. He’s standing just beneath a statue of Oliver P. Morton. The 14th governor of Indiana stands with his hand extended, waist high, palm held upward as if inviting the cacophony at his feet. Walker is wearing a Big Car mechanic’s shirt, cargo shorts, and teal blue socks. He’s smiling. He looks like an urban safari guide. Most days, that description isn’t too far off. A trio of skateboarding teens rolls by. On the other side of the marquee, a leather-clad guy who looks alarmingly like Julian from Trailer Park Boys revs up his Harley Davidson. Befuddled, quizzical smiles from passers-by walk on the sidewalk behind Funkhouser. I can’t help but chuckle at my surroundings, pinching myself at how lucky I am to witness this experimental performance on the doorstep of Indy’s most hallowed musical institution, Indianapolis Symphony Orchestra. This isn’t something that happens with regularity across the country. Experimental musicians are rarely offered this type of platform, and the unique nature of the performance isn’t lost on the crowd. John Flannelly, the curator for Listen Hear’s contribution to Spark is seated in the front row. He’s wearing a jean jacket, white paints, purple sunglasses, black dress shoes and is sporting a fresh haircut. For the previous two performances, Flannelly has been on top of the time, reminding performers: 30, 15, 5 minutes left. Today, he lets Funkhouser roll. He’s right to do so, as Funkhouser closes the set promptly at 7 p.m. Flannelly is on stage himself on Monday Aug. 24 at 6 p.m. as this week’s Listen Hear artist. With Funkhouser’s performance and rainfall in the rearview, I decide to walk home along the Cultural Trail to digest what I’ve just heard and seen. 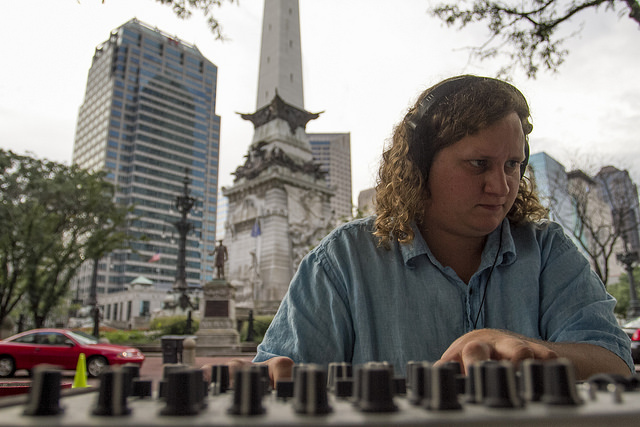 This fall, Funkhouser will return to school to study musical composition at Butler University. I can’t help but wonder whether one day the symphony held inside the doors in front of which he just performed will be celebrating and rearranging his works. 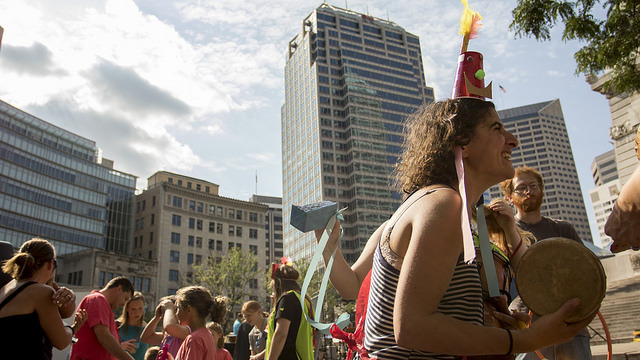 At 6:30 p.m on Wednesday Aug. 26, Indianapolis artist Kipp Normand will lead a themed walk that begins at Spark’s welcome trailer parked in front South Bend Chocolate Company on Monument Circle. As an artist, Normand uses found and repurposed materials as the building blocks for his celebrated installations. 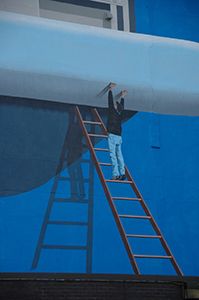 For a primer, check out Jennifer Delgadillo’s recent profile on Normand via Sky Blue Window. As one who specializes in found art, Normand’s view of his surroundings likely differs from the rest of ours substantially. With that in mind, I’m anxious to hear his interpretation of “Indy Oddities.” RSVP for the walk via Facebook.